Are you one of the 10 million Americans who suffers from TMJ (temporomandibular joint) disorder? #1. There is not just one cause of TMJ disorder. Although teeth grinding is one of the most common causes of TMJ disorder, many things that can cause it. These causes include stress, facial injury, muscle disorders, arthritis or a misaligned bite. No matter the cause, TMJ can cause a lot of pain and discomfort, so don’t put off getting treatment. #2. TMJ disorder can be difficult to diagnose. Because TMJ is so common, it’s easy to assume that it is simple to identify and diagnose, but in reality, there’s no specific test for TMJ disorder. 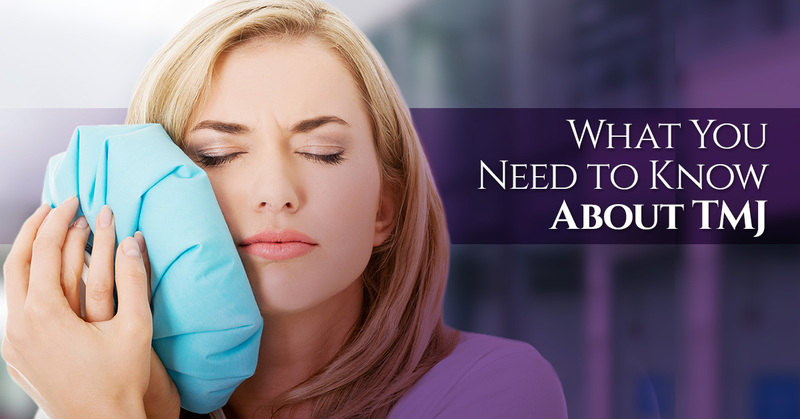 In most cases, your dentist will feel your jaw to gauge your tenderness or pain level. They will probably also have you open and close your mouth, listening for any popping, grinding or clicking noises. #3. Stress can make TMJ worse. It’s common knowledge that stress isn’t good for your health, but not many people realize that it can make an existing TMJ disorder worse, and it can also cause TMJ disorder as well. When people are stressed, they will often clench their jaws or grind their teeth. If you suffer from TMJ disorder, you should make relaxation a priority in your life. #4. Professional treatment for TMJ is not always necessary. Some TMJ disorders, particularly ones that are less severe, are often temporary and do not require professional treatment. In these cases, you can find relief from TMJ pain through an ice pack, over-the-counter pain relievers and by eating mostly soft foods. #5. Try to choose the least intensive treatment option available to you. When it comes to TMJ treatment, there are many options available, ranging from at-home treatments, like an ice pack or jaw exercises, to more extensive treatments, like surgery. According to the National Institute of Dental and Craniofacial Research, it’s best to choose a treatment option that won’t permanently change your bite or jaw, unless your case warrants it. In many cases, using an oral appliance can be incredibly effective, and it is far less risky than surgery. If you are one of the 10 million Americans who suffers from TMJ disorder, turn to James Otten Dentistry today. We offer a non-invasive approach to TMJ treatment that has helped many of our patients find relief. Visit us online to learn more about our treatment for TMJ disorder, and if you have any questions or concerns, don’t hesitate to contact us. We are always happy to provide you with the information and insight you need to make the right decisions about your oral health.